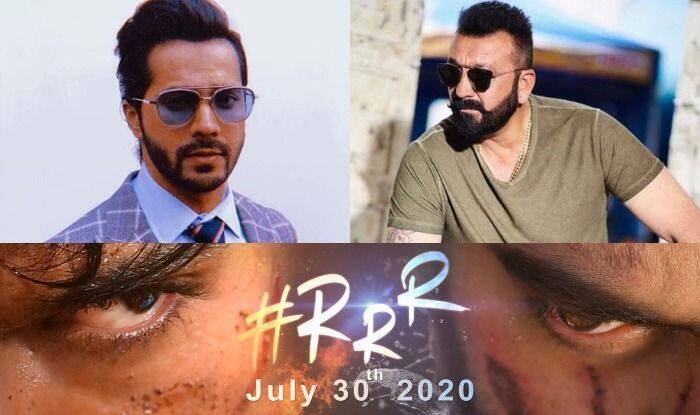 Sanjay Dutt And Varun Dhawan to Star in SS Rajamouli RRR With Ajay Devgn And Alia Bhatt? Latest reports suggest that Sanjay Dutt and Varun Dhawan will be starring in SS Rajamouli's RRR along with Ajay Devgn and Alia Bhatt. Alia Bhatt and Ajay Devgn had earlier been roped in for SS Rajamouli‘s next project RRR and with this film, the duo will be marking their Telugu debut. Latest rumours suggest that Sanjay Dutt and Varun Dhawan have also been roped in for the film. Though nothing has been confirmed as of now but speculations are rife that Varun and Sanjay will be starring in the film along with Alia and Ajay. Set in the 1920s, the film is a fictional story but is based on two legendary freedom fighters Alluri Sitarama Raju and Komaram Bheem. Earlier, the official handle of RRR Movie took to their Twitter to welcome Alia and wrote, “Welcome aboard, @aliaa08! We are glad to have you play the female lead in our film. Happy Birthday in advance and hope you will have a wonderful journey with us..:).” Alia retweeted the same and wrote, “Today I feel truly truly grateful.. Cannot wait to begin this beautiful journey with this stellar cast and massive team.. thank you @ssrajamouli sir for giving me this opportunity to be directed by you..”. Welcoming Ajay, they wrote, “. @ajaydevgn Sir, we are grateful to have you on the board. It’s a pleasure that you play a prominent role in the film. Can’t wait!.” To this Ajay replied by saying, “Happy to be a part… looking forward!”. RRR will also star Jr NTR who will play the role of Komaram Bheem and Ram Charan who will be seen as Alluri Sitharama Raju. The film is slated to release on July 30, 2020. Alia is currently busking on the success of her last film Gully Boy where she was seen with Ranveer Singh. She will soon be seen in Kalank which is a period drama set in the 1940s. The film also stars Sonakshi Sinha, Madhuri Dixit Nene, Aditya Roy Kapur, Sanjay Dutt, and Varun Dhawan in pivotal roles. She will also be seen in Ayan Mukerji’s Brahmastra with her rumoured boyfriend Ranbir Kapoor and Sanjay Leela Bhansali’s Inshallah which will also star Salman Khan.